Free Download AudioLabel CD/DVD Labeler 6.00 - CD, DVD, Blu-ray, LightScribe label software. 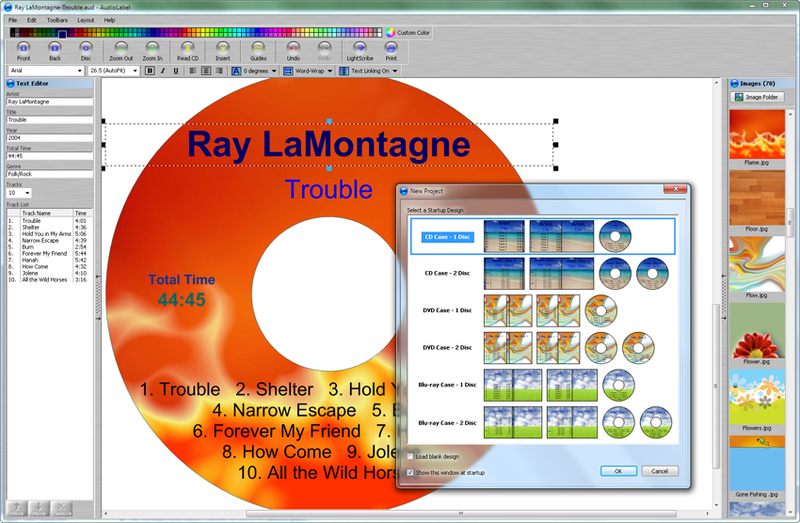 AudioLabel Cover Maker helps you design and print custom CD, DVD, Blu-ray, and LightScribe labels. Create truly professional labels quickly and efficiently. Add images, photos, backgrounds with a simple drag and drop interface. Quickly format text with a powerful editor that can layout and arrange text. Automatically import your CD album information and instantly fill out the label. Includes support for all major brands of label paper and the template dimensions can be adjusted to fit any non-standard paper. The program includes an art gallery and you can use the image-search function to scan your computer for existing images. Compatible with any LightScribe drive and also supports Direct Disc Printing with Canon, Epson, and HP printers. Really easy to learn - nice interface. I've tried a few others, but this one makes labels the fastest and has more features. Great program...i am a dj and recording artist and i can make professional looking cds with this program...I love it!!! AudioLabel CD/DVD Labeler 6.00 - Smart label software that creates CD, DVD, Blu-ray,and LightScribe labels. A complete Volume Control replacement that lets you easily change the sound volume by simply rotating the mouse wheel or by using hot keys. It includes an audio mixer, a scheduler, OSD, command line support, customizable presets.